What a difference a month makes! This had been such a wonderful hike last month, that I took this opportunity for a day hike with Maren to go back along the same route. Summer had definitely left, and there was the bite of winter in this day, although the skies were blue and there were few clouds all day. 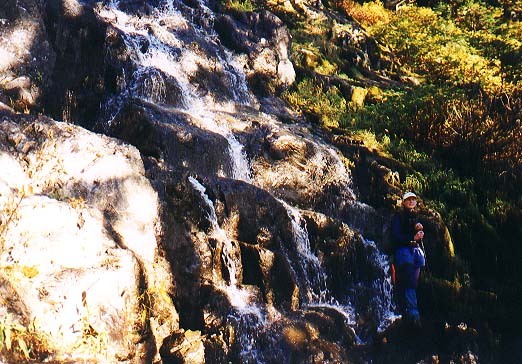 The chillier temperature felt good as we started climbing up to the waterfall crossing, but already the volume of water in the falls had started decreasing. Arriving at Lake Lillian gave us our next surprise - to continue around the lake and access the ridge to Rampart Lakes, you must traverse along the side of a boulder. Piece of cake in warm weather, but today the whole boulder was covered in ice and snow! This made for some very difficult footing in a few places. I took it very easy and slowly, while Maren forged up and around the top of the boulder and then dropped back down to the trail. Once around the lake, there was only the faintest dusting of snow, so the steep climb to the ridge top was very straight forward. The east side of the ridge, however, was coated in snow! We weren't expecting this, and didn't bring ice axes to help with a steep descent like this. Fortunately I had brought along some trekking poles, and sharing the two between us, we were able to safely work our way down to the outlet of the two little lakes. Of course, the lakes weren't the two sparkling ponds of September by now, but iced over, and ringed with snow. Fall doesn't last long here - winter was already settling in. 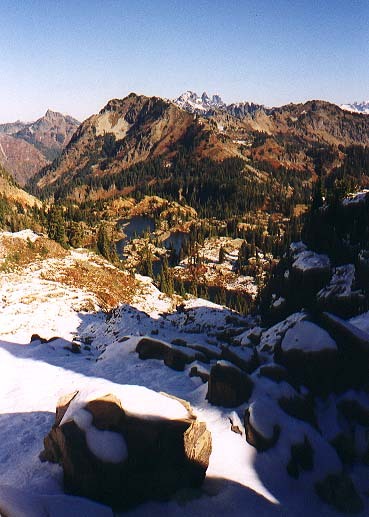 Once to the top of the next ridge, and looking over to Alta Mountain, we saw that the snow was deep on the north facing slopes, but almost absent elsewhere, and Alta appeared to be almost snow free. The descent down to Rampart Lakes again proved a little tricky without the security of an ice axe, but the trekking poles again helped, and only short slips on icy patches were experienced. The walk along the shores of the Rampart Lakes was splendid - we'd walked out of the cold north face shadow and into the late October sunshine. 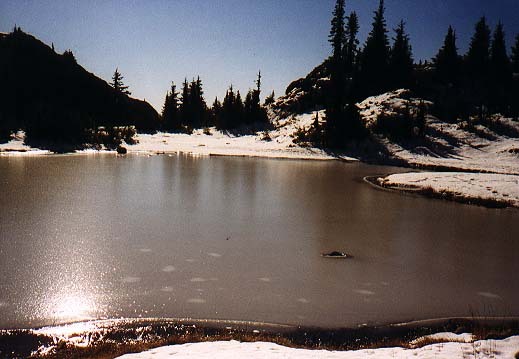 We paused to enjoy the sparkling waters, and wonder how the fish survive in a lake that freezes over completely. Continuing on along the ridge that connects Rampart Lakes to Alta, we peaked down at Rachel Lake, then continued north. At the base of the south ridge, we chose to go straight up the ridge, the same route I'd chosen last month. There looks like there is another way, around the east side of the ridge toward Lila Lakes. I think you can head that way, and then cut west up to the ridge top - that would be saved for a future trip, though. As we started up the ridge proper, the wind began to pick up. At points, we had to turn around to make breathing easier, and the wind was definitely knocking us off balance now and then - I'd guess it was at least 30 mph, maybe gusting up to 40 or 45. Even with the sunshine, this made the walking unpleasant, and we ducked behind the ridge to the west whenever we could to avoid the icy sting. 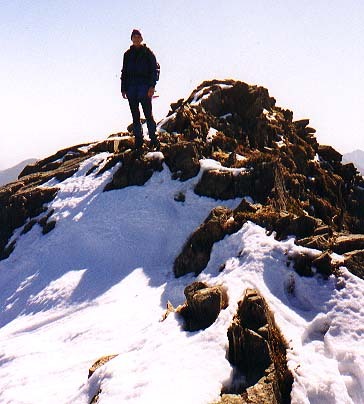 As we neared the true summit, more and more of the ridge was covered in a thin layer of snow. Being careful with our step, since some of the ridgetop trail was on downsloping rock ledges, and was now decidedly lacking in traction, we climbed up the final bit to the summit. Where I'd basked in the sun and leisurely studied the summit register only a month before, we were now set upon by a bitter wind, and decided to spend as little time there as possible. We spent a few minutes looking for the summit register so Maren could sign it, but couldn't find it anywhere - do these get retrieved before winter? Somehow I doubt it. We did an abbreviated version of "name that peak" (there are so many to see, we just had to look for a few minutes), then turned and rushed back down the south ridge to the comparative warmth of the forest. We retraced out steps, passing one other party who were on their way out via the Rachel Lake trail, and were glad we didn't have anywhere near that kind of distance to still cover. The climb up to the ridge over Rampart Lakes was a bit of a workout on the steep snow, but the rest of the trip was a breeze, and we returned to the car long before dark, unlike my last adventure on this trail!